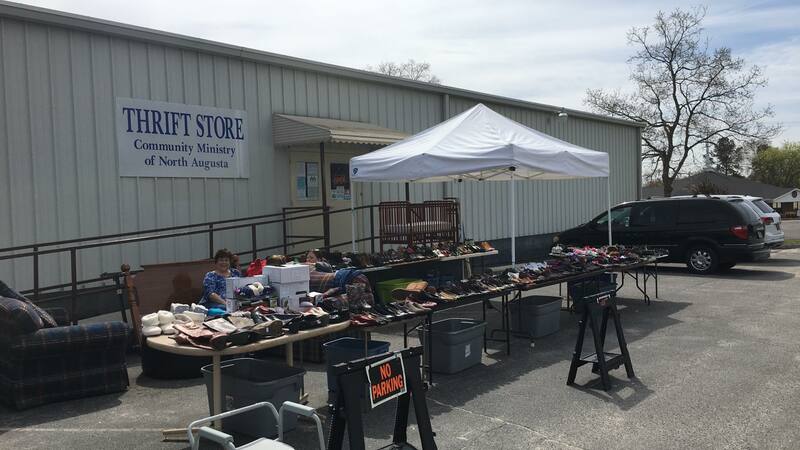 CMONA operates a wonderful Thrift Store to help fund our operations. You can find great clothing, furniture, household items, books, and jewelry. Every purchase helps us provide for North Augusta neighbors who need a helping hand. If you have items to donate to the Thrift Store, you can bring them by any time during our business hours. We accept any donation in good condition. If you’re interested in helping out at the Thrift Store, we’d love to have you. The Thrift Store provides much of the funding for CMONA. Our first location in 1984 was 608 West Avenue in a house rented to the ministry by Margaret Callicott. The Thrift Store moved to the Genesis Building at Grace Methodist in 1987. In 1994 CMONA moved to the old SCE&G building on Five Notch Road and Georgia Avenue where we paid rent of only $1 per year. With the larger building the ministry was able to expand its services. Many church members and citizens of North Augusta worked together to help renovate the building. The ribbon cutting was held July 9, 1994. In 1999 SCE&G sold the property and we had to make another move. The CMONA Board of Directors decided to purchase a building. A capital funds campaign was launched to raise $250,000 and we began to look for a building large enough to operate all the services we provide for those in need. The citizens of North Augusta came through with donations of $240,000 and labor to purchase and renovate the building at 646 East Buena Vista Avenue, the current home of CMONA and our Thrift Store.